In many cases, a garden office can be built without the need to apply for Planning Permission. As long as the building complies with the height and positioning rules laid out by Permitted Development. The Governments Planning Portal states these rules in list form, and whilst they are easy to understand, and are the definitive reference point, we thought it would be useful to add some garden office images to them! This article should only be used as a guide and is not a definitive source, you can find that on the Planning Portal. It is your responsibility as the house owner to check if you need to apply for Planning Permission to build a garden office before you start work - in the worst case scenario you can be made to take down the building! Its worth noting that the Planning Portal refers to buildings like garden offices as outbuildings. We will go through each rule as they are stated on the Planning Portal website. You can't build a garden office beyond the front wall of your house under Permitted Development. This means if you want to site a garden office in the front garden of your house you will need to apply for Planning Permission to do so. Outbuildings and garages to be single storey with maximum eaves height of 2.5 metres and maximum overall height of four meters with a dual pitched roof or three meters for any other roof. 1) The garden office must be single storey. 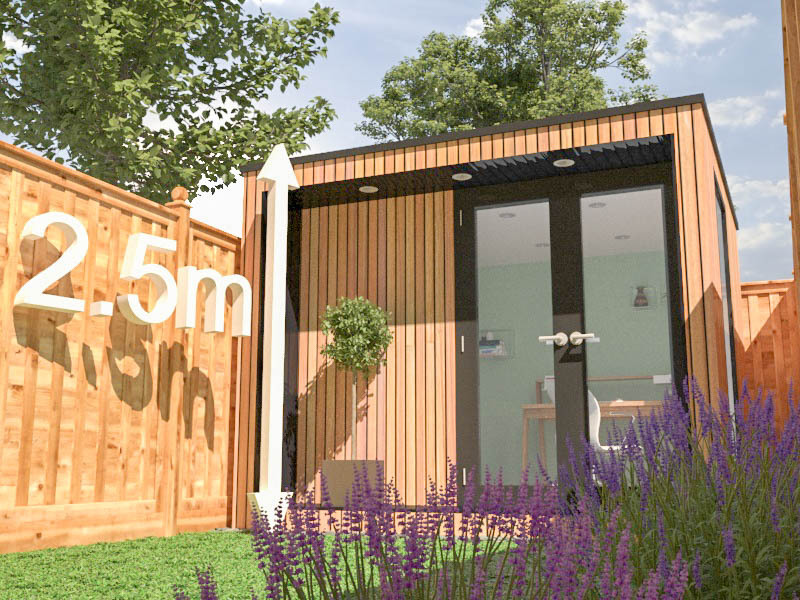 If you want to build a two storey garden office you will need to apply for Planning Permission. 2) This rule is also telling us that dual pitched roof garden offices should be no higher than 2.5 meters at the eaves and no taller than 4 meters at the ridge. Garden offices with this shape roof need to be sited more than 2 meters from each boundary. 3) Single sloped roof garden offices, also known as mono pitch roofs can be no taller than 2.5 meters at the eaves and 3 meters at the ridge to comply with Permitted Development rules. They should also be sited more than 2 meters from each of your gardens boundaries. Maximum height of 2.5 metres in the case of a building, enclosure or container within two meters of a boundary of the curtilage of the dwelling house. If you want to place your garden office within 2 meters of any boundary i.e. your fence wall or hedge. It can be no taller than 2.5 meters high, in most cases, this dictates a flat roof garden office. "Putting up decking, or other raised platforms, in your garden is permitted development, not needing an application for planning permission, providing: The decking is no more than 30cm above the ground together with other extensions, outbuildings etc., the decking or platforms cover no more than 50 per cent of the garden area." No more than half the area of land around the "original house" would be covered by additions or other buildings. The term "original house" means the house as it was first built or as it stood on 1 July 1948 (if it was built before that date). Although you may not have built an extension to the house, a previous owner may have done so. You may already have additions to your house like conservatories and sheds, greenhouses and decking. These buildings combined with the garden office should not cover more than 50% of your garden. We have always found the Planning Departments to be helpful, and its worth having a chat with your local office before you decide on a garden office to check your individual position in regards to Planning Permission. You can make a Pre-Planning application or apply for a Certificate of Lawfulness to ensure your building applies with the Permitted Development rules. There is a cost involved in this but its worth it for the peace of mind. Do you need to apply for planning permission?